Today we’ll take a belated look at Tim Lincecum, who signed a short but pricey contract extension with the Giants earlier in the offseason. Until recent seasons, Lincecum was a god among men. He posted a sub-3.00 ERA season as recently as 2011, but the wheels have been falling off the bus since 2008. Over these last six seasons, his average fastball velocity has declined from 94 to 90 mph. Meanwhile, he’s walking more batters and striking out fewer, although his numbers are still good. While there’s been ongoing speculation since the 2012 postseason that Lincecum could dominate in a relief role, the Giants will absolutely use him as a starter in 2014. What to expect from those starters innings is much more difficult to predict. This past season was a strange one for Lincecum. Case in point, on July 13, he threw a no-hitter, but his next outing was a 3.2-inning, eight-run clunker. This is representative of his season, which mixed gems with plenty of garbage outings. At a high level, Lincecum is still generating roughly the same number of whiffs as he did back in his days of dominance and he also got the walk rate back under control in 2013. The decline in strikeout rate probably means that he’s ringing up fewer looking strikeouts. He’s always burned a healthy number of worms (is it actually healthy to burn worms? that seems serial killer-y), but his last two seasons have seen elevated home run rates (homers per fly ball). This is a big part of the reason why his xFIP has been more than a run lower than his ERA over his past two seasons. xFIP does a better job of predicting future performance than ERA, which is why it’s a helpful statistic. With that in mind, a mid-3s ERA is possible for 2014 and this seems to be what the Giants paid to keep. 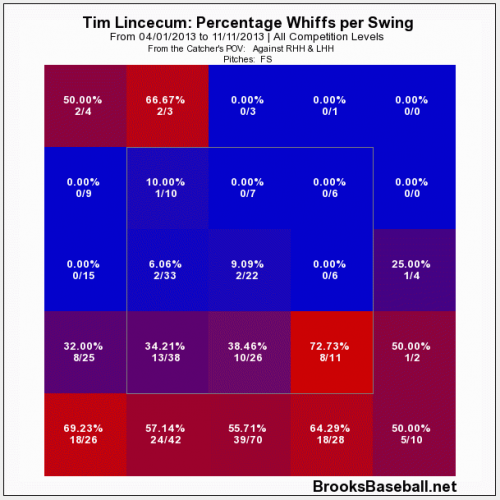 Digging into the PITCHf/x data, Lincecum’s come to rely more heavily on his change-up (classified as a splitter). He threw the pitch in nearly half of all two-strike counts to lefties and a third of all such counts to righties. The pitch is his bread and butter, since it generates both high whiff and groundball rates. As you can see from his results and averages, the change-up was particularly difficult to hit, but it also carried a very low .218 BABIP against. For his career, he’s managed a still good .277 BABIP on the pitch, which means we can expect about six percent more hits on balls in play in future seasons. Alternatively, it’s also apparent that his fastball was smacked around for plenty of hits and power. That’s the cause of his home run problems in 2013 too. Since 2007, he’s allowed 33 home runs off his fastball, 10 of which came last season. He also had trouble with the long ball in 2012, but surprisingly it was change-ups that got launched out of the park that season. These inconsistent year-to-year results make it appear as though Lincecum is seeing random fluctuation or a frequently changing skill set rather than something we can project accurately into 2014. Looking through the month-by-month data, it appears that teams did adjust to the re-emergence of Lincecum’s change-up. The number of whiffs that he generated per swing declined from 50 percent in April to 37 percent in June before stabilizing. The heat map shows his whiffs per swing on his change-up by location. Unsurprisingly, the low pitches performed best. We’ll end with a chart of his ISO allowed by pitch location. 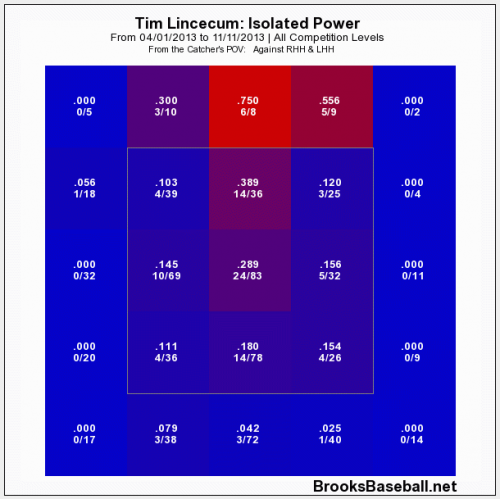 The visible T shows that high pitches and those down the middle were the big problem areas for Lincecum. Those 14 hits above the strike zone were particularly painful, but there’s cause for hope since there’s no theoretical reason to expect hitters to continue mashing pitches outside of the strike zone. All of this makes Lincecum very hard to project, which could work out in your favor come draft time. The less savvy owners may still continue to target Lincecum next season, especially since he threw that no-hitter and returned decent results overall. Some owners may cite xFIP as a reason to target him as well. So there’s no guarantee that he will come cheaply. We should expect continued inconsistency in 2014, which makes it a lot easier to target him in points and H2H leagues than roto formats. His overall performance depends heavily on whether we can expect his HR/FB rates to remain high. My inclination after reviewing the data is that he got unlucky with his fastball in 2013 and that he should see a league average HR/FB rate in 2014. Since he’s a groundball pitcher, that expectation really helps his value. Lincecum has been extremely durable throughout his career, but he’s entering his age 30 season with a heavy workload on his diminutive frame. In other words, be on the lookout for signs of injury like further declines in his velocity or a spike in walk rate. At the end of the day, a high 3s ERA, good strikeout numbers, and poor run support comprise his fantasy profile. As such, he should be priced similarly to Jon Lester, who I suggested as a $3-8 target in 12-team leagues (around the 15th round for snake drafters). In retrospect, that figure may be a touch too conservative, but you’ll still want to tread lightly. Do you mind explaining how you come up with the calculation for the statement, “As you can see from his results and averages, the change-up was particularly difficult to hit, but it also carried a very low .218 BABIP against. For his career, he’s managed a still good .277 BABIP on the pitch, which means we can expect about six percent more hits on balls in play in future seasons.”? Thank you. Great article. Took me a moment to get it too, got me head scratching too. What he’s saying is that for Lincecum’s career, he has a .277 BABIP on the changeup, but had a very low .218 BABIP in 2013 and thus can expect to be hit closer to his career .277 BABIP, which is about 6 percentage points (it is really more like 25-30% more hits) higher than the .218 BABIP in 2013.